In the last weeks God’s creation has seemed anything but good. Terrorist attacks, ambushing of police, and police shootings of unarmed young men continue to rent the very fabric of our society. Yet God did not create an evil world, in fact God proclaims this world a good world where everyone, and I mean everyone, has what they need to live and be the person they are meant to be. It is our choice’s, not God’s, that have created a world that is unsafe. Spending time in silent contemplation with a focus on what we could have been, and still could be, seemed the only way for me to center myself and see the world as good. 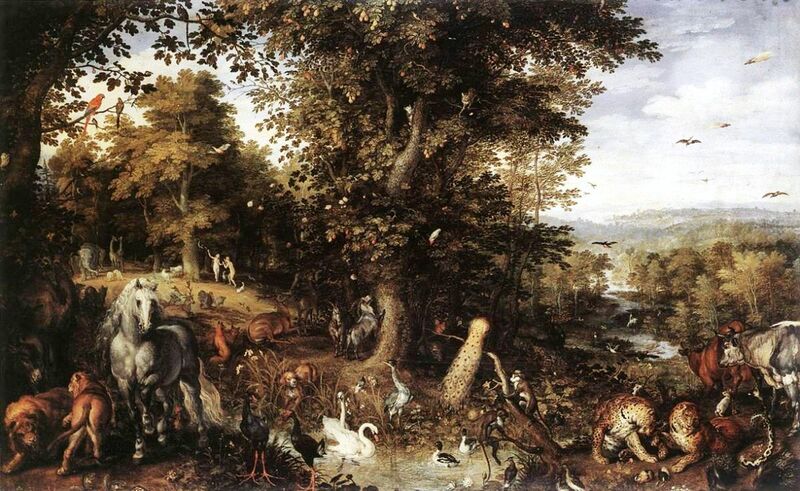 So today I offer as our prayer of the week another Visio Divina using the above painting of the Garden of Eden by Jan Brueghel. 1. Study the picture slowly, taking a first glance noting the colors, the placement of the plants, animals and, people. Remain with the image for one to two minutes. If you would like, jot down a few words about the image. Take a second, deeper, look. Where is there movement? What relationships do you see? Engage your imagination. Where are you in the artwork? What do you see from that perspective? What deeper meaning emerges? What feelings about the world rise in you? Are there any images that you are particularly drawn too? Respond to the image with prayer for the world. Did the image remind you of an experience, person or issue for which you’d like to offer thanksgiving or intercession? Offer that prayer to God. Please do not let your belief, or non-belief, in the Garden of Eden and the subsequent fall from grace prevent you from seeing the good things in creation. Our world is in need of prayer right now. All of our people, all of creation is crying and in pain. Let your prayers go out into the world and let them lead you to be the person God has always wanted you to be.